At Connection Couriers, we are able to provide a competitive quotation to carry fireworks distribution (1.1G, 1.2G, 1.3G, 1.4G and 1.4S) throughout our nationwide network. We can call upon the expertise of in-house DGSA’s (Dangerous Goods Safety Advisers) and we have fully-trained drivers and fully-equipped vehicles available, from vans to articulated units and trailers. 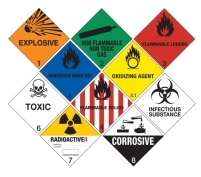 All operational staff receive mandatory dangerous goods awareness training. Many drivers and some key operational staff are trained to a higher level and hold an ADR vocational training certificate for all classes of dangerous goods including explosives such as Fireworks. As an approved, independent training provider, we provide ADR training that ensures a level of consistency and procedural continuity within our industry and our organisation. Our staff and drivers are familiar with terms such as NEQ/NEC (Net Explosive Quantity/Content) and are aware that there are specific load thresholds involved for Fireworks Distributors.